I’m pleased to announce a new occasional series here on Electric Archaeology: “New Talent Tuesdays”. I have been getting queries from grad students, talented amateurs, avocational archaeologists and historians, about the possibility of contributing to this blog. At first, I was reluctant… but then I thought, why? And no good reason presented itself. So, if I can help someone else join the conversation then that certainly fits the mission of this blog, and academe more generally! If you are interested in contributing, send me a note with a brief background, links to your work, and your ideal topic. I graduated in 2007 from the University of Maryland with a History Degree. Unimpressive GPA, but still over a 3.0. I was happy with my path in college but I was a little afraid of the prospect of finding work. I had tons of student loan debt already so I wasn’t thinking Grad School. I took the first job I could find. I began working at the Four Seasons Washington, DC doing Audio Visual work. Setting up events and selling clients on all the wonders fancy AV could bring to their meetings- not exactly groundbreaking research on Rome or Egypt! After a year of working for the company, I was introduced to a program that really has begun to change my life and my direction. I began creating 3d models and renderings with Google Sketchup. Sketchup is a free program distributed by Google that is a more user friendly version of AutoCAD. Coupling that together with Kerkythea, a free open source rendering program, I began creating 3d renderings of our events and hotel space for our clients. You can see some of my work here. I am still learning and hope to increase my talents. My career path had gone in a new direction. One evening I was sitting around watching the History Channel and the old series Engineering an Empire came on. It hit me; I have found a way to meld both parts of my life. 3D Visualization is a perfect way to bring Ancient History to life. Not only are so many famous monuments from history destroyed or badly damaged; the ones we currently have are not even as impressive as they would have been in their day. A great example is that Trajan’s Column originally would have been in lush color. Check out a report here. What a way to bring this back to life! How did I get involved in Historical 3d Visualization? Well I started reading articles about creating your own business, your own blog, or just simply starting your own project. One great piece of advice was to start tweeting about what you are interested in. So I created 3dhistory on Twitter. I began to document all the work I was planning on trying or just some interesting posts that I found. I am now up to 52 followers, not impressive, but hey they are real people! Pretty cool stuff I thought. 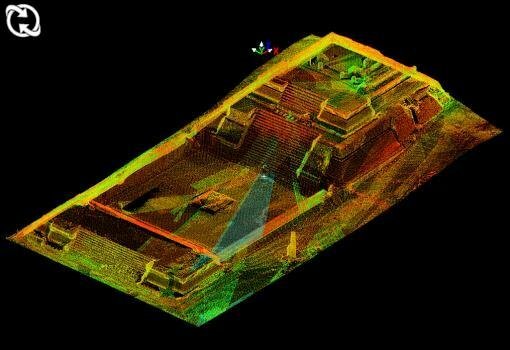 I mentioned them in a few posts and they sent me back a message saying they had a lot of very accurate laser scans of Pre-Columbian monuments that could be used to create 3d models. 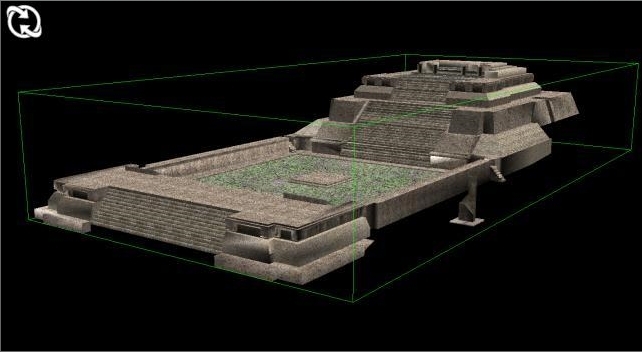 This started a dialogue that ended up with me creating a 3d Model of their laser scan of Monte Alban, the original capital of the Zapotec Empire. I was able to use their cloud point technology and Sketchup to recreate the largest building at Monte Alban for their website. Check it out. I currently am working on sites at Chichen Itza for them. I give all my thanks to social networking and the urge to actually put in extra time and put myself out there. I volunteered for a job I did not know I could finish. I took a different approach and now I have a great contact in a bourgeoning field which interests me greatly. I plan on continuing this work as much as I can. If you are not currently involved in social networking you should be! I was able to get in contact easily with a company I read about in a magazine. I do not know how that would have been possible years ago. I hope to continue to show these projects more and promote the use of 3d Visualization in history. Soon I will be launching 3dhistoryblog.com where I will document my work and the tireless work of others. There is amazing stuff out there that truly can bring history to life. Nice interview, I have been using SketchUp for the recreation of historic sites for about a year, its a powerful little program with lots of application in archaeology and history. Looking to connect with others doing the same!